Taking pieces from many coaches, Coach Jamie Dixon's 4 out, 1 in motion is hard to guard and puts great pressure on the defense. The priorities of this motion are spacing, screen for driving opportunities and post isolation. A two-guard front guarantees ball reversal, which is crucial to stretching the defense from side to side. Teaching the offense begins from a 3-on-3 alignment. The guard to guard pass creates a diagonal screen for the wing. Keys to the diagonal screen are staying wide on the floor and reading the defense. Seven reads are available for the cutting based on the defense's posture. Another weapon of perimeter motion is the flare screen. The passer receives the screen from the wing, leaving the wing area open for his flare cut. Cuts such as the re-screen/fade, basket cut, curl/screen and back cut. In a post and wing scenario, the back screen becomes a good choice, as well as the re-screen/fade option. Flexibility is gained by allowing perimeter players to cut into an open post area and become back screeners on ball reversal. Screening action involving perimeter and posts is effective and causes mismatches. Dixon also covers the various options after the ball is passed to the post. Attacking the zone starts with getting the ball inside the zone. Coach Dixon puts a premium on post players that can catch, pass and make plays in traffic. The first drill is a shooting drill from the baseline to simulate playing against a zone. Priorities are catch, rim, partner, throw opposite and dive. Perimeter breakdown is accomplished by playing 3-on-0 on the perimeter. The point, wings and corners can all be filled by guards. Penetration is a big part of attacking zones and Dixon teaches one hard dribble and jump stop into the zone. In a 5-on-0 alignment, the zone offense is demonstrated using many of the options that Dixon teaches. The short corner is a vulnerable spot on the floor for the defense and can be exploited in this offense. The high post is also an excellent area for the offense. The on ball screen on the perimeter can create penetration into zone gaps causing coverage problems for the defense. Set plays are used early in the possession to create movement and flows into the main zone offensive attack. The benefit of this zone offense is that it takes advantage of areas where the zone is weak and makes it work by using ball and player movement. 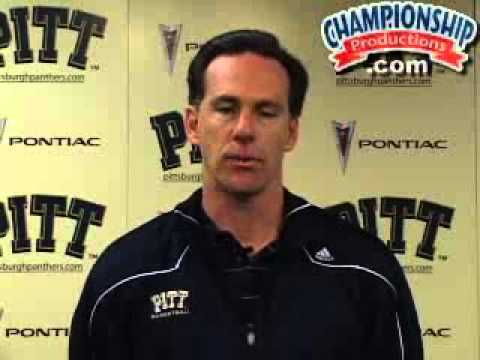 Teaching players where to be in every defensive situation on the floor is a Jamie Dixon trademark. His 10-point shell drill covers every possible defensive scenario and anchors the Pitt defense in games. As the ball is slowly reversed around the perimeter, Dixon instructs players on the proper position and technique at each spot. When the ball is on the wing, there is automatic penetration to the baseline. This forces the weak side defense to be in a help position and adjust toward the ball to keep the ball out of the paint. By moving players down to the corners, the focus is on middle penetration. Stance, vision and moving in the direction of the pass are cornerstones of good man-to-man defense. Defending the ball screen has become mandatory for all teams. Dixon explains the on ball coverage that minimizes risk but is aggressive. Other sets defended are the UCLA screen set, flex and flare screen set. The last component is doubling the post and doubling the on ball screen. Dixon teaches specific technique on a hard, aggressive double team. 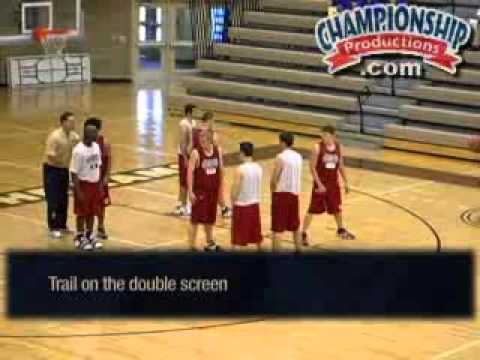 Dixon illustrates that almost every situation faced in a game can be prepared for in practice with the 10-point shell drill. Good post play is the anchor of Coach Dixon's 4-Out 1-In offense. Dixon shares drills to strengthen play in the paint. The Mikan and McHale drill are used to develop concentration, eye-hand coordination, explosion, finishing at the rim and conditioning. 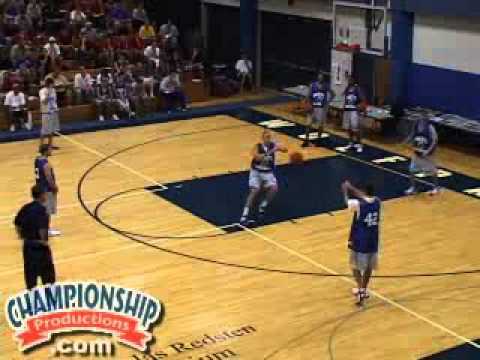 Superman is an explosion drill where the ball is taken from the floor to the rim. Dixon stresses the catch and location of the catch, patience, locating the defense, being "comfortable" before making your move and recognizing your options. The Post Series addresses several skills and concepts for good post play, which are addressed through live 1-on-1 play in a competitive environment. Keeping the feet free and live is a major part of playing in the post. Other techniques that Dixon touches on through drills include keeping hands up on defense, getting in scoring positions and are prepared to catch the ball, the inside jump hook and step through in the paint and more. This DVD delivers the total package for teaching low post players! Coach Dixon breaks down the perimeter portion of the 4-Out 1-In Offense. Four spots on the floor are designated as perimeter areas - the two wings and the two guard slots, those areas above the lane line extended. 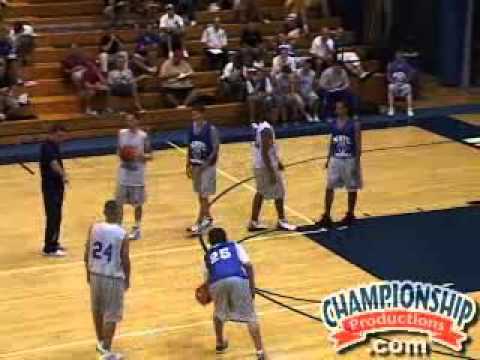 The sweep series begins the workout and is a required drill for all perimeter players. Dixon teaches players to get open, catch, sweep and drive to the basket or pull up and shoot. An important teaching point is a 6-inch shot fake, making the move to the basket quicker. The next progression is the jump shot from the same cuts executed in the sweep series. Drive and drag is a baseline drive followed by a dish to a teammate. Keys to this drill are finding the angle, getting to the right spot and making yourself available for the catch. The 3 W's teach players to use screens efficiently and represent being wide, waiting for the screen and watching the defense. The cutting series begins with the basket cut, followed by curl high, back cut, pop and the fade cut. Penetration work is a big part of this defense and is worked on in a 2-on-2 setting. The multi-purpose transition drill works on conditioning, penetration positioning, reading the court, hands and ball movement. Defending the ball screen and the back screen is perfected in a half court 2-on-2 drill. Perimeter development comes also from 3-on-0 and 4-on-0 drills.